After deciphering the cause of Scarecrow’s “reading illness,” Batman and Robin track his thugs to a warehouse. While Batman follows the one escaping thug, Robin cracks open some electronics to find the offending gizmo. Meanwhile, Scarecrow has a bizarre dream in which his desire to educate is challenged by his desire to incite fear. Elsewhere, Robin saves Mayor Hill from becoming “infected,” and informs his honor and Gordon of the true cause. The escaping thug returns home, only to find his mother surrounded by paramedics. Without the ability to read, she had taken the wrong medicine. Batman confronts the thug, and learns the Scarecrow’s location. The dynamic duo head to Scarecrow’s facility on a large shipping vessel. A fight ensues. 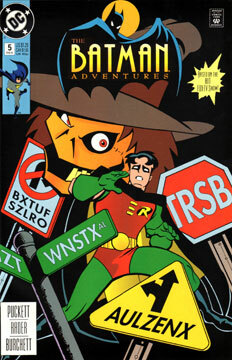 Robin plays off of the Scarecrow’s inner conflict to obtain the “antidote” device. Scarecrow ends up back in Arkham. Both this issue and the previous part one suffer from a plodding plot. The story is decent enough, but it should have been one issue. In this issue, the “duality of Scarecrow” seems to come out of nowhere in an effort to fill the pages. The final fight is long and dull. And the giant stack of old-fashioned televisions, eleven rows high, unrestrained on a boat? Really?